I was just a kid during the war and like most kids sometimes I played truant. I remember one particular day a couple of friends and I went down to Preston Park. Opposite the park in Preston Road were large houses filled with Canadian soldiers. They were very friendly and chatted to us. Best of all they gave each of us a large chunk of cheese. I remember that the three of us scoffed the lot! 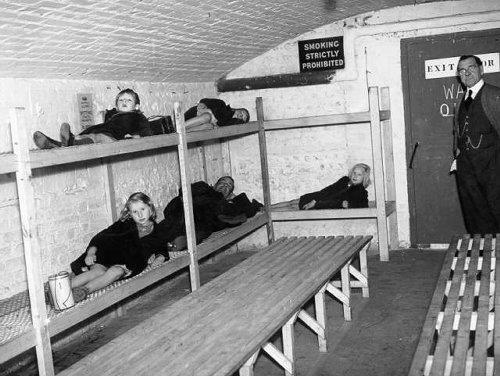 I remember too that in those days everyone was expected to help the war effort – even kids. One day at school we were asked to go out and collect any metal or old iron. A lot of us went over to the allotments at the end of Nesbitt Road and dragged back all the old iron we could find. 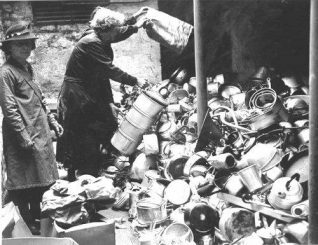 To help us out, our mums gave us any old saucepans they could spare. Sometimes the air raid siren would go off when we were in school. If that happened we would file down into the air-raid shelters that were built under the playground. The headmaster would come around with a large jar of boiled sweets and give one to each of us. At home we never used the Anderson shelter that we had built in our back garden because it was cold and running in water. So instead when the siren went we all sat under the stairs. There are a couple of quite awful memories I have of being a kid in the war. I remember that one day two of my school chums, Peter Idle and Terry Johnson, took a stroll over to Bevendean. They found a bomb and actually took it home. Peter tried to take it to bits – it exploded and the whole house was blown up. Another time me and a couple of mates wandered down to the seafront. We were standing there watching a soldier in a tank clearing the beach of mines. He got out of the tank and was walking up the beach when there was a loud explosion. His body landed in the barbed wire in front of us – and his head in the Kings Road. An old man grabbed the three of us and sent us on our way. I had nightmares about that for weeks afterwards.